What Percent Of Wells Fargo Does Warren Buffett Own? Wells Fargo is one of the largest stock positions in Berkshire Hathaway's portfolio. As of the end of 2016, Warren Buffett's conglomerate Berkshire Hathaway (NYSE:BRK-A) (NYSE:BRK-B) owned 479,704,270 shares of Wells Fargo (NYSE:WFC) worth a total of $26.8 billion. This translates to a 9.5% stake in the banking giant. However, Buffett also owns a smaller position in his personal account, and the combined stake is just over 10%. Here's why Warren Buffett loves Wells Fargo, why he recently sold some of his shares, and what to expect going forward. In the aftermath of the infamous "fake accounts" scandal at Wells Fargo, Buffett revealed that he had not sold a single share of the stock and called the bank an "incredible institution." The reason Buffett feels this way is easy to understand. 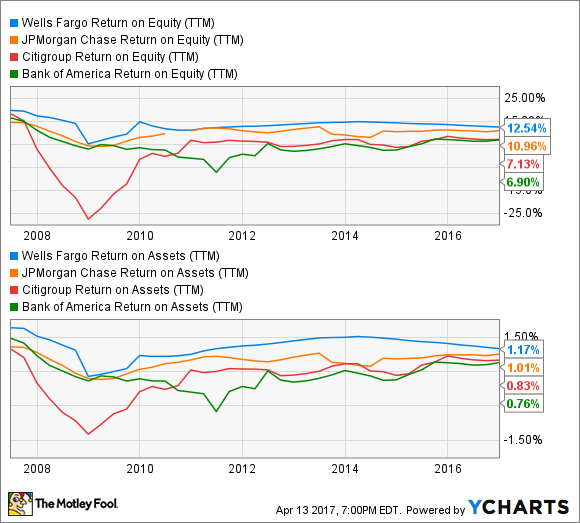 For starters, Wells Fargo consistently runs an extremely efficient and profitable operation, handily surpassing the rest of the "big four" U.S. banks on return on equity (ROE) and return on assets (ROA) year after year (the blue lines in the 10-year chart below). In addition, the bank has done a great job of growing rapidly without sacrificing quality. Throughout the financial crisis, Wells Fargo experienced much lower loan losses than its peers and remained financially stable. This is illustrated by the fact that Wells Fargo paid the least amount of settlements out of the big banks in the crisis' aftermath -- by a wide margin. It was also the reason the bank was able to scoop up rival Wachovia at a deep discount. Source: Keffe, Bruyette, & Woods. If Buffett loves Wells Fargo, why is he selling millions of shares? On April 12, 2017, Berkshire Hathaway announced that it is selling about 9 million shares of its Wells Fargo stake -- about 2% of the total. This may sound like a big deal at first -- after all, Buffett had been adding to his Wells Fargo stake for many years. However, it's important to take a step back and look at the reasons Buffett decided to sell these shares, which had nothing to do with the bank as an investment. All indications point to Buffett still considering Wells Fargo one of the best banks in the U.S. Instead, Berkshire is selling the shares to reduce its stake to less than 10% of the bank, thereby avoiding additional regulations from the Federal Reserve. Specifically, the Fed wants to know that investors with large positions in banks don't intend to have a controlling influence. Berkshire originally sought permission from the Fed to increase its Wells Fargo stake above 10%, but has since decided against pursuing the matter. Now that Berkshire has publicly stated its intent to keep its stake at less than 10% of Wells Fargo, it's a safe bet that the company won't buy any more shares of the bank, at least not anytime soon. To the contrary, it's likely that Berkshire will need to continue to sell more of its Wells Fargo stake over time, particularly if the bank continues to buy back its own stock. For example, Wells Fargo recently reported that it reduced its outstanding share count by 19.4 million through buybacks during the first quarter of 2017. This makes the remaining shares worth slightly more, and buybacks like this will create a perpetual need for Berkshire to sell some of its Wells Fargo shares on occasion to stay under the 10% threshold.